My son and daughter needed a golden wedding card for their Nan And Grandad so asked me to make it for them . I used a 6 x 6 inch blank card. I used gold mirror card to make a mat then white pearlised card. I used an off cut of textured wall paper, using an edge punch I made a fancy edge. 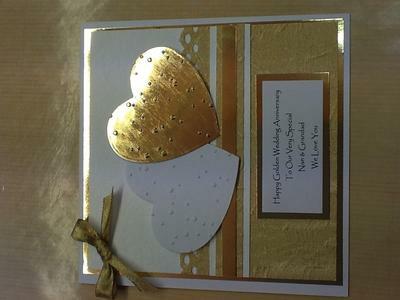 I die cut 2 hearts one in gold mirror card and one in white pearlised card then used an embossing folder to pattern them. Printed the sentiment on the computer mat and layered that, then tied a gold bow. I used silicone glue to stick the hearts on to give it some dimension. Everyone was thrilled with the card. Pretty card for a very Special Anniversary and I am not surprised that other people loved it. A hand made card is always something to be cherished and I bet you felt really proud of yourself for your designs. Hi Diane. A very lovely card. You can see you put a lot of work into it. Well Done!